Here’s a version of something that comes late in Chapter One of my Ecologies of the Moving Image manuscript. This follows a description of Andrei Tarkovsky’s film Stalker (USSR, 1979), which I take as a kind of paradigmatic model for the process-relational framework the book develops. Here I discuss the film in its relationship to its social and material contexts, including that of the Chernobyl accident, which occurred seven years after the film was released, but which the film might just have anticipated. Biblical resonances within the film emerged in interpretations of Chernobyl as ‘wormwood,’ the literal meaning of ‘chernobyl’ and, according to Russian and Ukrainian interpretations of the Book of Revelation, the site of the apocalypse. A video game called ‘S.T.A.L.K.E.R. : Shadow of Chernobyl,’ created by a Ukrainian design team and now with over two million copies distributed worldwide, combines all of these themes and adds its own mutants, physical anomalies, radioactive waste, and the like. 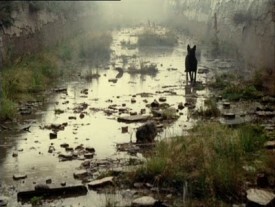 The film has thus served as a source of imagery and a template for the hopes and fears of Soviet (and post-Soviet) citizens in the wake of an ecological catastrophe, a catastrophe that catalyzed an environmental movement which was to contribute powerfully to the demise of the Soviet Union itself. In its often cited prescience, Stalker’s ‘cinematic materialism’ can thus be taken as both a symptom and an affect-laden carrier of hopes and fears that would ultimately bring the Soviet Union to its end. The making of the film contributed to this layering of political and environmental overtones. It was filmed twice, both times under challenging conditions, since Tarkovsky was considered somewhat of a dissident and was not always allowed to film what he wanted, yet the respect and international admiration for his work provided him a measure of protection. The first version of the film was destroyed during processing. Rumors circulated that it was destroyed by Soviet censors, though it seems likelier to have been a matter of ineptness and defective film stock. It took several months for Tarkovsky to convince Mosfilm to fund and allow a refilming, which they did on the principle that this was not the same film but a sequel to the (missing) original. 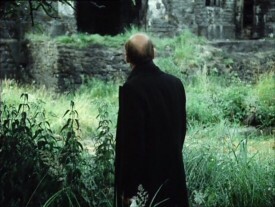 Tarkovsky later conceded that this was fortunate, since the second version veered even further away from science-fictional themes into the metaphysical. Both productions took place in and around an abandoned Estonian power plant and downstream from a chemical plant that, unbeknownst to the crew, released toxic pollution into the environment in which they spent months filming. The film shows, at one point, inexplicable foam floating on the river and, at another, snow, reportedly a form of chemical fallout, falling in summertime. The penultimate scene of the Stalker and his wife and child walking home shows, in the background, a power plant that, in retrospect, eerily prefigures the Chernobyl nuclear plant, or that in any case represents the Soviet industrial sublime at its most uncanny. The presence of toxins in the water and air left its effects on the bodies of the film crew: several crew members reported allergic reactions during the filming, and a number, including the actor Anatolii Solonitsyn, eventually died premature deaths from cancer and related illnesses. Tarkovsky himself died of cancer of the right bronchial tube in December of 1986, the same year as the Chernobyl accident, at the age of 56. His wife died of the same cause some years later. The film is often compared to Solaris. The Zone is a space of nature, prohibited and thus set apart from the ‘world,’ but it, or the Room at its center, exercises a magnetic or strongly ambivalent pull on the psyche. Similarly, the ocean that covers the surface of Solaris exercises a powerful effect on its human visitors, who remain locked in its orbit as if they are compelled by it to relive their deepest traumas. Both seem to trigger an encounter with conscience, a conscience that is shown to be inter-human (dealing with the ethics of how we relate to others) but which is also suggested to be ecological (the ethics of how we relate to nature and the cosmos). The Zone, and the zone within which the planet Solaris exercises its hold on its human visitors, in this sense may be taken to embody an Other within the psyche, but an Other made up of the ethical and material relations and emotional entanglements that confront individuals and force them to face their pasts and account for their lives, loves, failures and misgivings. Both films also suggest that nature – though in the case of Solaris it is the nature of another planet – may be an active and even sentient agent, one that precedes us and in many ways gives rise to us, but one that also follows us and covers us over, as earth covers earth in its sedimentation of memories, meanings, and elemental cycles. 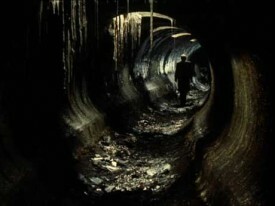 In the case of Stalker, the long takes and camera movements portray a visceral “gravitational” pull towards the Earth, as Zizek describes it. In Solaris, this is represented both by the apparent pull toward the planet’s surface (no longer resisted by Kelvin in the film’s near-psychedelic climax) and Kelvin’s seemingly real reminiscences of his rustic earthly home, which is revealed in the end to be floating on an island in the ocean of Solaris. Ultimately the meaning of the Zone, like that of Solaris, is left open. It is this semiotic underdetermination, this openness to interpretation combined with a resonant use of imagery and cinema technique, that makes it a particularly good example of film’s [Peircian] “thirdness,” its semiotic productivity, its capacity for producing meanings, percepts, and affects. The Zone may be extraterrestrial in origin, supernatural, or simply natural. It may represent the archetype-laden depths at the center of the psyche, in a Jungian interpretation, or the unrepresentable and ungraspable void at its core, in a Lacanian one (the difference between the two will be discussed in Chapter Six). It may represent the sheer contingency at the heart of life, a contingency that haunts us and reminds us (in a Buddhist interpretation) that our grasp on our very selves is illusory, fleeting, and ultimately empty of self-sufficient existence, that is, the kind of existence we can hang on to and keep separate from the ever-passing flux and flow of experience. Or it may be taken, in more conventionally Christian terms (which, in its Eastern Orthodox form, is the tradition closest to Tarkovsky), as the call of conscience in the midst of material grasping and social pretense. To the extent that Stalker gestures towards a transcendent zone that is outside of the grasping ego, or outside the all-too-human world of civilizational rises and falls, it does this by means of the world itself – by displaying the world in the sheer facticity of its ongoing becoming, florescence and deliquescence. Cinema works by representation, so to the extent that it can show us the world at the same time as it gestures toward its disappearance, film can make it possible to think the interaction between the representable and the unrepresentable. The journey that takes us, as viewers, into the zone of cinema is much like this, and we are free to make of it what we will (though it may never be entirely a matter of our rational choosing). At its best, cinema exercises a compelling tug on the imagination; it charges or magnetizes the psyche in ways that may not be fully evident to our conscious awareness. What we get out of films depends, to a large extent, on our dreams and desires. As in Stalker, however, what cinema shows us is real objects, artifacts from the material world: landscapes and places, mortal bodies and organisms, all caught in the grip of the cycle of living, dying, and decomposition. These shown worlds – not the fictional worlds portrayed by them, though the two are necessarily related – are intimately involved in the essence of cinema. Cinema is neither a mirror nor a window; it is not purely reflecting nor perfectly translucent. As Stalker’s cinematic surface suggests, it mixes opacity with a certain semi-transparency and mirror-like diffraction of the world outside. It captures images and sounds from the material and social worlds, but then rearranges them, assembling them into new configurations to produce new or different meanings, affects and percepts (in Deleuze’s terms), and worlds. In the digital era, even the ‘originals’ are not always originals, yet they are based on something original, and built out of elements – whether glimpses, ideas, and gestures, movements of the wrist on a computer mouse, or electrons, silicon chips, and visual data bits – as real as any other bits of an ultimately ungraspable ‘earth’ that provides for the disclosure of worlds, but ever eludes those worlds into self-concealment. An ecologically inspired ethic of cinema, such as I develop in this book, advocates for a greater attention to be paid to the relationship between the worlds produced by cinema and the world(s) from and within which they are produced – worlds that are material and biophysical as well as social and epistemological. 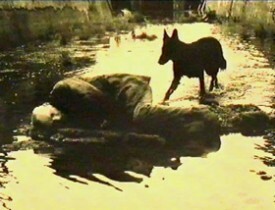 In the case of Stalker, for instance, the extra-cinematic Real includes the centrally managed cultural industry of the Soviet administrative state, under the auspices of which the film was produced, as well as its shadow side of suspicion, paranoia, and interest in the paranormal, all expressed in the film and in the meanings it engendered. (In this sense, the film could be usefully compared to the X-Files, a television series I will briefly discuss in Chapter Six.) It includes the world of industrial technology, represented in the film by the power plants both real and fictional, which, as Heidegger suggested, turn the world into ‘standing reserve,’ and which were developed to do this with maximal urgency in the Soviet state’s anxious quest to keep up with its capitalist rivals. It thus includes the Cold War system itself, with its race to the moon and its quest for the bomb, ultimately delivering to us both Chernobyl and the downward, Earth-b(e)aring gaze from Sputnik and Apollo. It includes the perceptions of filmgoers, among them those who interpreted Chernobyl through reference to the film (and to the Bible), and the artistic and religious imaginary of late modernism, which could be taken as the encounter of Enlightenment rationalism with its own limits – an encounter into which seep all manner of spiritual and romantic phantasms and longings. Tarkovsky himself lived in and breathed the heavy atmosphere of industrial late Soviet modernism. We, today, may be inhaling, if not hyperventilating, something distinctly less heavy and more ‘fast’ – the oxygen of a light-headed digital world. 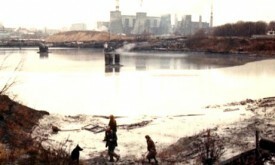 But the material world featured in Tarkovsky’s long takes – the signs of human history covered over by the passing of and return to elemental time – is not all that different from our material world, the shadow side of which is also populated with toxic waste dumps, landfills, hypodermic needles, and disfigured icons of various kinds. Siegfried Kracauer subtitled his influential 1960 treatise on film theory The Redemption of Physical Reality in part to indicate that cinema was uniquely qualified to record reality in a way that allowed its viewers to experience that reality more fully. Cinema is qualified to do much more than record reality, and Kracauer’s ideas have not all withstood the test of time as well as others, but the ethic of redeeming physical reality remains worthy of pursuit. While this book will follow some dramatic departures from the realist aesthetic promoted by Kracauer, the ideas and interpretive strategies I will develop are ultimately aimed at this project of redeeming the material reality of the world, a world that is shared and shaped by humans and nonhumans at a time of precarious relationship between them. The virtue of films like Stalker is that they attempt to redeem the sidelined, forgotten, or ‘shadow’ side of material reality, and it is this side that must feature as central within any ecologically minded filmmaking and theorizing today. See also the mysterious Something‘s post on Chernobyl and the town of Prypyat, with reference to Tarkovsky’s Stalker. I’m really glad to see this here! keep working on this manuscript, can’t wait to read it. film-worlds and worlds beyond and the interfaces between them, like eisenstein’s japanese masks . . .
Chernobyl has become a terrible thing that ever happens, now japan also get the same disaster as chernobyl. I hope the world leader start think the negative impact of having nuclear reactor as they source of energy.